I was preaching on November 19 at First United Methodist Church, a strong and active United Methodist congregation in the north central Iowa county-seat town of Algona, population 5,500. After lunch, Marvin Chickering, a member of First UMC, drove us a few miles to the Kossuth County Fairgrounds, where the Algona Nativity Scene is located. The story began during World War 2, when thousands of German soldiers were transported to the Algona, Iowa area as prisoners of war. During the war, four million German soldiers were killed, three million were injured, and eight million German soldiers became POWs. One of those POWs was a German named Eduard Kaib, an architect by profession and radio man in the war. Imagine being captured in France in August 1944, taken to a holding camp in Italy, and then transported to the middle of the Iowa corn fields in the fall! Plus, Kaib was sick with a gastric ulcer. Almost 400,000 German soldiers were brought to the US during the war and were housed in five hundred facilities, mainly in rural areas in the South, Southwest, Midwest, and Great Plains. The major camps in Iowa were located in Clarinda and Algona. 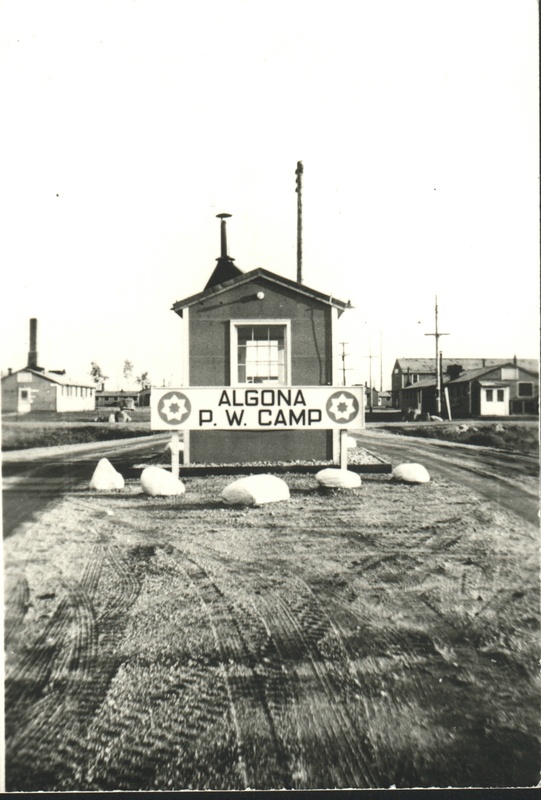 The Algona camp was built on 287 acres with 180 buildings and 160 military guards and could accommodate up to 3,000 prisoners. 10,000 German POWs called Algona home from April 1944 to February 1946. The prisoners were guaranteed rights under the Geneva Convention and worked mostly in farm labor by repairing machinery, detasseling corn, and harvesting vegetables. They were paid 80 cents a day, received in credit. In the Algona camp, prisoners created an orchestra, choir, and drama club. But the camp became most well-known for POW Eduard Kaib, who, upon arrival in Algona, had a vision of bringing the joy of Christmas to the camp. Like prisoners of war the world over, the men in Algona keenly felt the isolation and loneliness of separation from their loved ones and country. That loneliness intensified all the more at Christmas, as the POWs remembered the holiday festivities and traditions of their homeland. 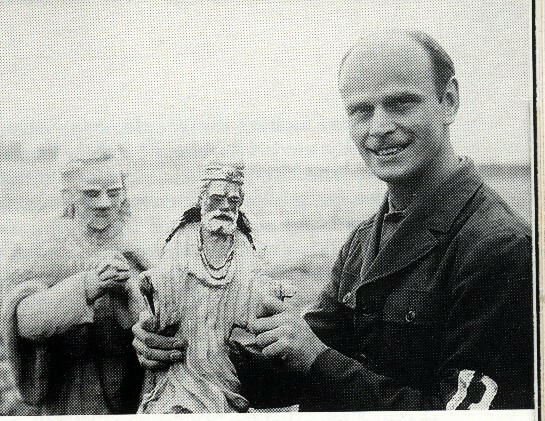 During that first Christmas of 1944, Kaib built a small nativity set by shaping the Iowa soil into 18-inch-high figures, baking them in an oven to harden, and then arranging them in a 12-foot wide space in the prisoners’ quarters. On Christmas Eve, the prisoners gathered around the nativity scene and sang “Silent Night” (Stille Nacht) in German. Kaib’s labor of love attracted the attention of the Camp Commander, Arthur Lobdell, who asked Kaib if he would be willing to create a much larger Nativity Scene for the camp. The only stipulation was that funds would have to come from the prisoners themselves. 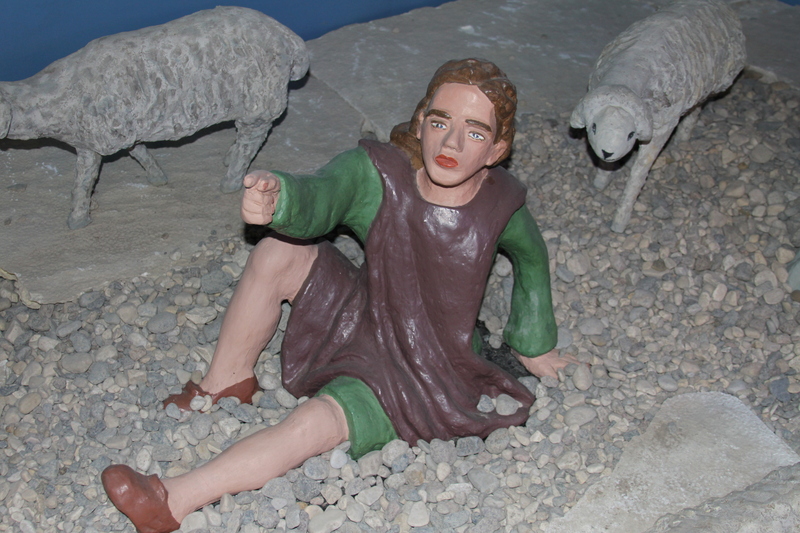 Kaib and five other POWs started in January and worked on the nativity the entire year. As a noncommissioned officer, Kaib did not have to work in the fields and could devote all of his time to this project. In December 1945, they unveiled the fruit of their labor: 65 figures, half life-size, each made of wood and wire frames covered with cement, plaster, and paint. One of the camels weighed 500 pounds! There was the infant Jesus, Mary and Joseph, kneeling shepherds with 31 sheep, the wise men, and angels. In the background was the town of Bethlehem. The detail and intricacy of the work takes your breath away. The $8,000 cost was entirely paid for by the meager daily earnings of the prisoners. When the war ended and the prisoner of war camp was closed, the German prisoners donated the Nativity Scene to the community of Algona with the provision that it was would always be free to the public. 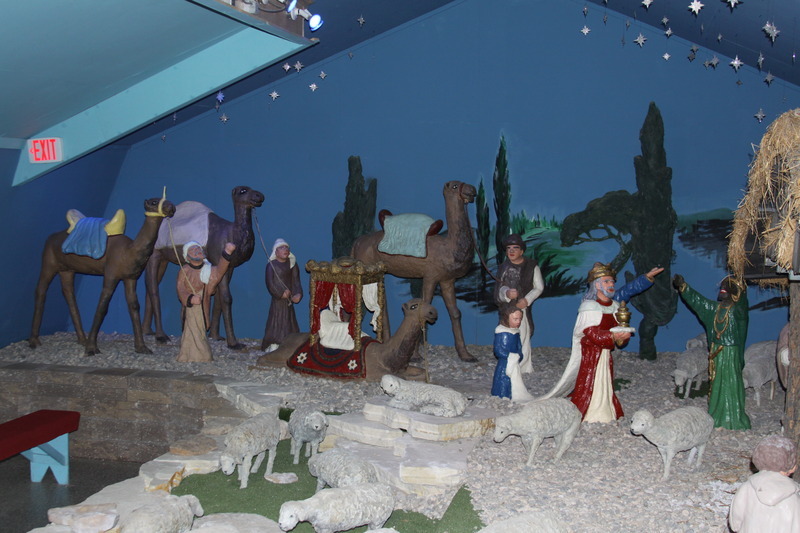 The Junior Chamber of Commerce decided to make it a permanent exhibit, and Eduard Kaib helped move the Nativity Scene to its new location, where the figures were repaired and repainted and lighting and heating was installed. During the war, when many German congregations in Iowa stopped using the German language in worship because of hostility and persecution from fellow Americans, the POW’s in Algona were tearing down walls by building a nativity scene. 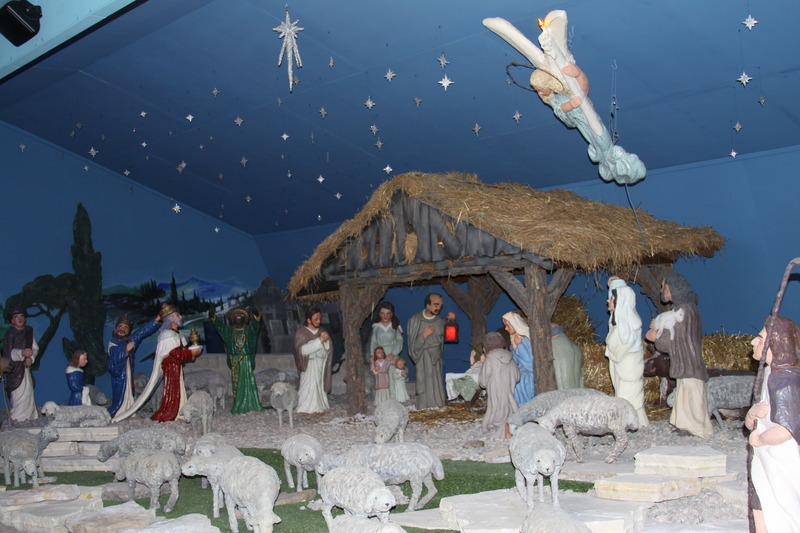 For 73 years, the Algona Nativity Scene has been available for the public to view in December and upon request at other times of the year. The Algona Nativity Scene not only helped to heal the wounds of the war, but it has been a testimony to how our “enemies” are not always our enemies, as prisoners and guards stood side by side singing Christmas carols in German and English. After the war was over, most of the prisoners returned to their homes, but others stayed in the U.S. In some cases, relationships between POW’s and farm families became friendships that were maintained over the years. What a gift the Algona Nativity Scene has been! Residents were so blessed by the impact that Kaib’s Nativity Scene had on the town as well as on visitors from around the world that they raised the money to bring Eduard Kaib and his daughter back from Germany for a visit in 1968. At that time, Kaib painted a mural of Bethlehem on the back wall. A year ago, Kaib’s granddaughter came to visit the Nativity Scene for the first time. As I sat in wonder in front of Kaib’s masterpiece that day, taking in the magnificence of the 65 lovingly-made figures in the Nativity Scene, I listened to a song written especially for this setting. Fear Not was composed in 2003 by Iowa native Joyce Johnson Rouse. It’s part of Rouse’s CD, Christmas Heart. [i] Click here to listen to the song (used with permission). War and peace the circle goes, must it begin again? Maybe those who hold us here are not the enemy. As we stumble on our way to find our own humanity as well as the humanity of others, how will God use you to bring peace on earth this Christmas? What would their captors say of this, and would they try to stay the prisoners’ hands? Townfolk hesitated – What of their brothers at the front? Was it disloyalty to share a Christmas moment with these German sons? War and peace the circle goes, must it begin again? [i] Christmas Heart available on iTunes, Amazon, CDBaby, and www.earthmama.org. 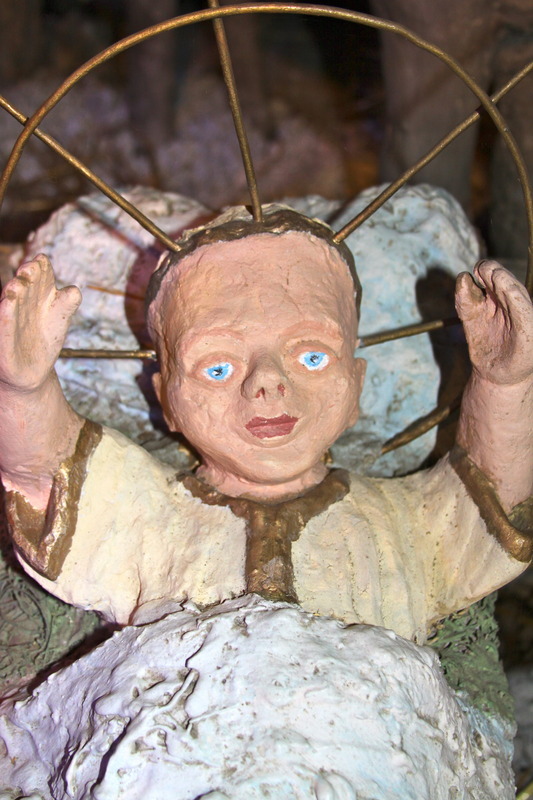 Memories are fond ones of “babysitting with Jesus” each year at the Algona nativity with church family members. This story of love amid the fear and hate brings me to tears, especially when I hear the song. Thank you, JoAnn for sharing beautiful memories. Thank you Bishop Laurie for this. Touching history and beautiful song. Who’d have thought, In the heart of Iowa our enemies turned out to be loving the same Jesus? We lived at West Bend, just down the road from Algona, moving to Southern Iowa in 1963. Many a time my father told about the Nativity at Algona, telling about how they worked for various farmers around the area. He knew all about it and how it was built. He had lived there all his life until we moved. About 20 years ago while serving the Allerton, Clio, Lineville Parish as a Local Pastor,, my wife and I mentioned the Grotto at West Bend and the Nativity at Algona. Within a week we took a group of around 20 plus people up there on a 24 tour. They too thought it was all wonderful. Amazing how love can bring people of all nations together, if we are willing to try. Thanks for the wonderful story!! It’s as new today as it was when it was being built!! Merry Christmas!! You made the story come alive, Marv! Thank you for taking the time to show us the Algona Nativity Scene. What a beautiful story of love and devotion. With gratitude for learning this part of our history! Beautiful story inspiring a beautiful song! Thank you to each creative soul who has continued to share the potential for oneness, unity, and harmony. That was beautiful! Thank you for the amazing story and music. Thank-you for sharing this lovely story and song.